We tend not to feel constrained by convention around here. Our favorite Christmas Eve dinner is a large platter of our homemade potstickers, for example. We’re not big fans of the classic frosted cake. There’s nothing wrong with it — none of us dislikes cake, exactly; it’s just not our go-to dessert for special occasions. Therefore, Tom and I had a wedding brownie, a lovely tower of fudgy brownies drizzled with white and dark chocolate and accented with chocolate-covered strawberries. It was, as you can imagine, deliciously different. We often go the brownie route for birthdays as well. But my favorite choice for birthday celebrations, the one I made for my own birthday a few days ago? 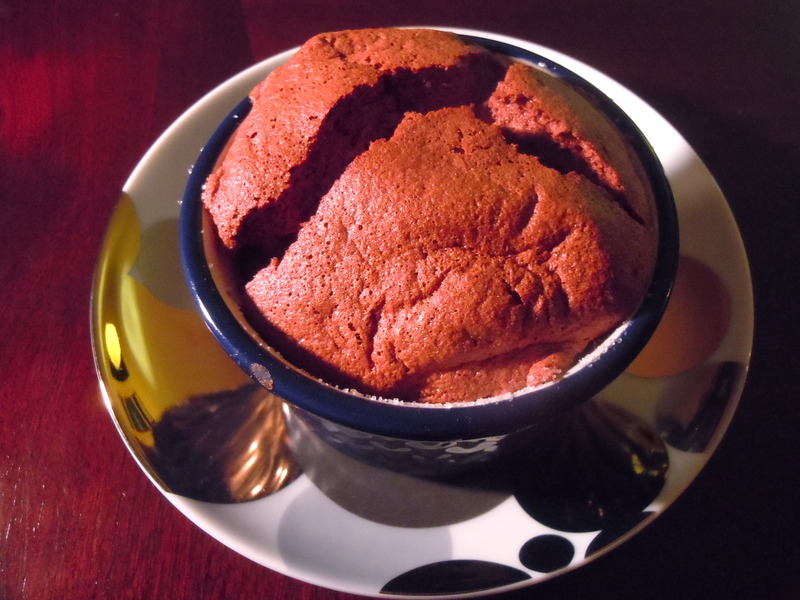 Individual chocolate soufflés. They have such an air of extravagance: that lofty crown, deep brown with a hint of gloss; the texture, simultaneously airy and rich; and that decadent aroma that fills the house with the promise of chocolate. But the secret reality of these soufflés is that they’re simply and quickly made with a very few ingredients. In fact, they actually qualify as healthy (for a dessert, anyway). The only fat is in the chocolate, there’s very little sugar, and the egg whites provide protein. I used 8-ounce ramekins, but anything from 4 oz. to 10 oz. will work as long as the bowl has straight sides. It’s important to prepare the ramekins so the batter has a surface to cling to. Butter every speck of the interior of the dish, then dump in a tablespoon or so of granulated sugar. Turn the bowl around so that sugar clings to all the butter. Pour any extra sugar into the next ramekin. I’ve also made them in hollowed-out oranges, which is very pretty, although the soufflés don’t rise as much in them. The soufflés are even better with a scant teaspoon of grated orange zest stirred into the melted chocolate, or a heaping tablespoon of crushed peppermint candy. Serve them straight out of the oven. Like most soufflés, they’ll fall if left too long. We like them with a few orange segments on the side, or with a spoonful of our favorite ice cream nestled in the center, or with a big dollop of whipped cream on the side, or with a few gingersnaps to dip in… you get the idea. Heat the oven to 375 degrees F. Smear the insides of 4 ramekins with the butter. Pour a few tablespoons of sugar into one of the ramekins. Tip the ramekin, rotating it, to coat the entire inside with sugar. Pour the excess sugar into another ramekin. Continue with all the ramekins until they’re all well coated with butter and sugar. In a separate medium bowl, beat the egg whites until frothy. Add about a tablespoon of the sugar. Continue beating and adding the sugar until the whites reach stiff peaks. Stir a large dollop (about 1/3 cup) of the whites into the melted chocolate mixture until well combined. Pour the chocolate onto the remaining whites. Fold gently just until combined. Put the prepared ramekins on a cookie sheet. Divide the batter equally among the ramekins. Bake for 15-18 minutes, until the soufflés are puffed and only have a slight jiggle. Serve immediately. This entry was posted in baked goods, sweet stuff and tagged chocolate, cocoa powder, dessert, egg whites, elegant, mousse, souffle. Bookmark the permalink. Thanks for this lovely simple recipe for mousse. Easy, delicious and perfect for a dinner party or a cold night when one needs something special! Happy New Year to you my blogging friend, I have enjoyed finding you and look forward to keeping up with you in 2012. Happy New Year and Stay Cozy. Happy New Year to you too, my friend, and thanks for the lovely comments. Oh, I cannot wait to try it! Happy New Year! Happy New Year to you too, Jennifer. 2. Under “Settings” on the far bottom left. It will give you a menu. 5. Drag and drop the ones you want. You can put as many as you want, but the most popular ones I know of are facebook, twitter and email. It might bring you traffic too…. Just thought I’d share that. You can ignore it if you don’t like the share button. I’ve found not everyone knows about it. I’m spreading the word because I really like your page. I made this last night for a special New Year’s Eve dessert and it was fabulous! Hurray! So glad you liked it.